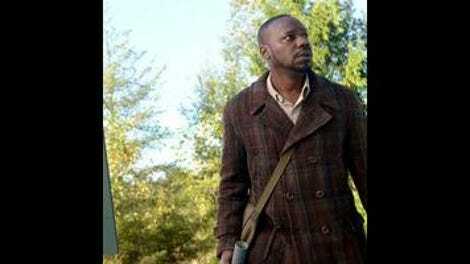 If last week’s episode of Timeless saw the show settling down, it’s this week where it comes into its own. “Party at Castle Varlar” is a breezy, self-assured affair, one that still makes time for actual stakes and moments of connection. The larger goal, however, is to get the job done and look good (and have fun) doing it. There’s a palpable and compelling sense of confidence about the whole affair that makes it really easy to overlook any flaws in logic or holes in plot. It’s efficient, persuasive, and utterly charming. This is perhaps a stretch, but those are all qualities one hopes to see in a good spy (a good fictional spy, anyway), and “Party at Castle Varlar” has got one of those, too. 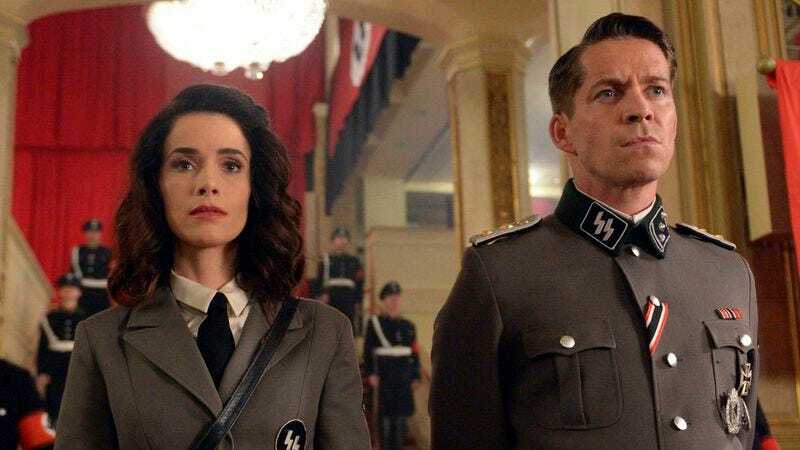 Sean Maguire’s (Once Upon a Time) turn as Ian Fleming marks a high point for Timeless guest stars to date. It’s a winning performance of a character that offers plenty of opportunities for both fun and high-stakes action (and we get both). The thing that works best about Fleming as a character, however, is this: his presence matters, both actively and thematically, to all three of our leads, and that makes a hell of a difference. Her reaction to Fleming and the mission gives Wyatt something to do as well, and just like that, the soldier becomes something more than a bland wash of grief and growling. Like Spencer, Matt Lanter has his best episode to date, with moments of substance (such as his scene with Lucy about getting over the hump) balancing out his winning Bond fanboy moments. The result: a character that feels human. Lanter’s charming performance makes it clear what a drain the largely dull Wyatt has been on the show’s dynamic thus far, so let’s hope that, to borrow an expression from Wyatt, the show’s gotten over the hump when it comes to this guy. Lucy and Wyatt both crystallize this week, but Rufus just keeps being terrific. The last episode saw Rufus (and actor Malcolm Barrett) freed from the whole “stand outside of a building and learn and/or teach some lessons” thing, and that continues here, even with Nazis hanging around. That’s not to say Rufus is all comic relief this week. To him, Fleming represents a person who’s learned to lie to everyone around him, something he’d sorely like to be able to do at the moment. Fleming says the key is that there’s never trust, only the mission, and that’s a lesson Rufus takes to heart, in a manner of speaking. By the time they return, he’s decided once and for all that he can’t “spy on” (read: record) Lucy and Wyatt, that he trusts them, and that trust is important, given what they’re doing. Presumably, Rufus trusts Connor Mason, too, and that seems like a mistake. As Rufus dries home, something goes wrong with his car’s radio/navigation system/air conditioner/Siri/whatever, and as he pulls over to check it out, so does an old white guy who knows Rufus’s name. This scene wasn’t quite as threatening as it might be, but Barrett sells the hell out of it. The shift in his eyes when the Rittenhouse dude mentions his family makes it clear that this poor guy will be toeing the company line from here on out. How can you blame him? Like Lucy, this guy’s no soldier. The show’s acknowledgement of how green both these people are adds an element of risk to the show that it was sorely lacking. But Fleming’s effect on each of the three main characters isn’t the only reason he works as a guest star, and nor is the the only historical figure who turns up. It’s a small thing compared with the bracing competence and sense of fun that make this episode so entertaining, but man, does it help that neither Fleming for Werner von Braun have faces as iconic as Lincoln or Kennedy. They’re important figures in two totally different ways, but there’s no trace of the cognitive dissonance (or waxworks effect) of previous weeks because their faces aren’t burned into our minds. But whether audiences are familiar with the characters or not, at least this week, doesn’t matter. In its fourth episode, Timeless stops spoon-feeding the audience, trusting that the historical tidbits will make sense, that those watching at home can handle a quicker pace, that we can bounce from punchline to pathos with ease. It’s a good bet, and one that pays off with an episode that finally achieves the promise of the pilot’s finest moments. There are real stakes here, and moments of connection, but mostly we’re getting in a big round ball and hopping around in time with some weirdos. Sounds fun, and at least this week, that’s exactly what it is. It’s really impossible to understate how much better this show is when Wyatt does something other than grieve and glower at people. Highlights: his slightly defensive assertion that he speaks four languages; his rush to make sure that everyone knows that he loves both the movies and the books; his geeked reaction when they all show up in a Bond novel. Until that scene with Wyatt, I was sure that we were going to learn that Lucy’s Jewish. Speaking of Lucy being terrified, I love the payoff of Wyatt always doing her seatbelt for her. It’s always encouraging when a thing you thought was just a show being dumb ends up being a smart, intentional choice. Villain update: still don’t really care about Flynn, but the idea that they stole that core to make an untraceable battery is great. So much more interesting, and a way better hurdle for Mason Tech to grapple with. Our only real hint of Lucy’s family drama comes at the end, and it’s another great choice. Now she’s got a reason to stay involved beyond obligation, and a cover story for her job (not something every show would acknowledge). Honestly, I’ve got no time travel complaints this week. Sure it’s improbably, and in theory Fleming’s cover got blown when it shouldn’t have been, but who cares. I had fun.